Pentaplast Supreme Putty is a water resistant white cement based putty ideal for use on concrete/ mortar walls (internal and external) and ceilings. 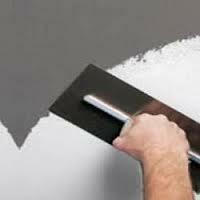 It fills the fine pores of mortar /concrete walls and ceiling and proves a white, smooth and dry surface, essential for painting. Pentaplast Supreme Putty can be applied even on moist surfaces ( Internal I External ). Pentaplast Supreme Putty has more adhesive strength, durability and enhances the life of paints . Pentaplast Supreme Putty though white cement based, does not require water curing. Being cementitious material it has better adhesiveness and durability. Excellent bonding to the base plaster/ concrete. Suitable for interiors as well as exteriors. Excellent, super smooth, super finish. Clean the surface,loose particles, dirt, grease and traces of foreign material form the surface, if necessary, by using sand paper or by chipping. For loose plaster areas, remove the defective material and replaster the area. For ceilings / walls, which are not even, replaster it with Rokso Ready mix Plaster to make them even. Take 10-12 litres of clean water per 40 kg bag in a clean bucket. Add the required quality of Pentaplast Supreme Putty. Adjust the water to the amount of plaster used at a time. Add further water as required. Re-mix again for about 2 minutes. Use the Mix within 60 Minutes. Dampen the surface to be plastered with clean water.Allow excess water to drain off. Using a steel trowel / blade, apply the above mix to a thickness of about 1 mm. Level and smoothen the surface. Apply the second coat after the first coat has fully dried and set. The thickness of each coat should not exceed 1.5 mm. Smoothen with a steel trowel, Sand paper if so desired, with 600 no.sand paper. Rokso India Pvt. Ltd. is promoted by the Shwetketu Group Of Companies. The company is managed by well qualified professional from the variety of fields which includes Civil Engineers, Chemical Engineers, Interior Decorators. The Company manufactures finest quality products for the construction industry. The Rokso is the only company in India which offers products to cover all the stages of Construction Industry i.e. Plinth To Paint. The needs of Modern age construction are far more different than the past. Today’s construction Industry demands very high performance chemical solutions and Rokso is very well equipped & technically capable of developing customized Chemical solutions for all areas of construction i.e. Plinth To Paint.